Dave Eggers, the accomplished Northern California novelist, returns to nonfiction storytelling with this captivating account of a young Yemeni-American businessman who dreams of reviving his homeland’s lost legacy as the birthplace of top-notch coffee. 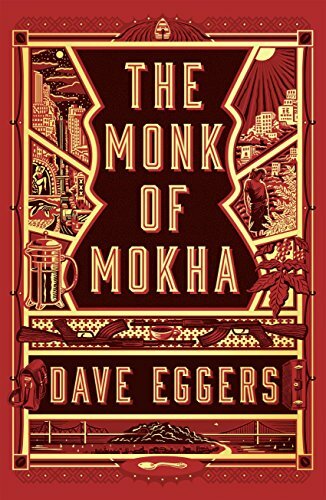 Egger’s new work, The Monk of Mokha, is narrative nonfiction at its best, blending detailed reporting with imaginative characterizations that yank readers into this story and never let us go. From the beginning of Chapter One, we care deeply about what happens to young Mokhtar Alkhanshali, who grows up in San Francisco’s gritty Tenderloin neighborhood and lands a job as a doorman in one of the luxury high-rise apartment towers that have transformed much of this once-diverse town into an enclave for high-tech entrepreneurs and the financial elite. The book begins with this municipal tale of rising haves rubbing shoulders with the disappearing have-nots, but the story quickly turns into an international drama pitting the American dream against a Yemeni nightmare. Longtime San Francisco residents will remember the sights and smells of the old Hills Bros. roasting plant at the foot of the Bay Bridge. Visitors from the East Bay were welcomed by the giant painted image of a white-bearded, yellow-robed Arabian raising a cup of coffee above his head as if asking Allah to sanctify this mysterious brew. From his post at The Infinity towers, Mokhtar spies what’s left of the Hills Bros. San Francisco plant—a statue of that Arabian connoisseur, whose robe Mokhtar recognizes as made from traditional Yemeni fabric. That encounter inspires this ambitious son of Arab immigrants on a caffeinated journey into the precious world of West Coast coffee snobbery, where a single cup can cost 15 bucks. Much of this inflationary excess is the result of too many people with too many dollars and not enough sense. But some of it is a corrective reflection of the fair trade movement, where small businesses work directly with overseas farmers to pay them a decent price for their hard-earned commodities. It’s into this territory that our main character immerses himself. Mokhtar fakes his way into the high-end Bay Area coffee business, getting just enough financial backing to make it to Yemen, which is considered along with Ethiopia as the Coffea arabica Garden of Eden. Eggers weaves together mythic accounts of Yemeni mystics and Ethiopian goat herders discovering the exhilarating effects of chewed berries on their flocks and on themselves. He follows up with the 17th century saga of colonial powers stealing the sacred bean, serving it in Venetian cafes and Viennese coffee houses, then growing it with great success on the Dutch island of Java, and then at tropical outposts around the world, culminating in today’s $70 billion global coffee business. Mokhtar Alkhanshali’s journey to revive and upgrade the mostly abandoned Yemeni coffee trade throws him into that nation’s brutal war between Iranian-backed Houthi rebels and a collapsed government— a tribal and religious conflict intensified by U.S. drones and Saudi airstrikes with American-supplied fighter jets. Our hero’s journey turns into an adventure story with comic undertones as Mokhtar—intent on making it home to attend a coffee conference in Seattle—shepherds five suitcases of coffee samples through a war zone and onto a leaky boat that barely makes it out of the ancient, crumbling Yemeni port of Mokha. Eggers’ highly entertaining new book seems destined (like his novels The Circle and A Hologram for the King) to make it onto the big screen. We won’t tell you here what happens in the end, but if you can’t wait to find out, or are wondering if anyone would ever pay twenty bucks for a cup of coffee, go to www.portofmokha.com.